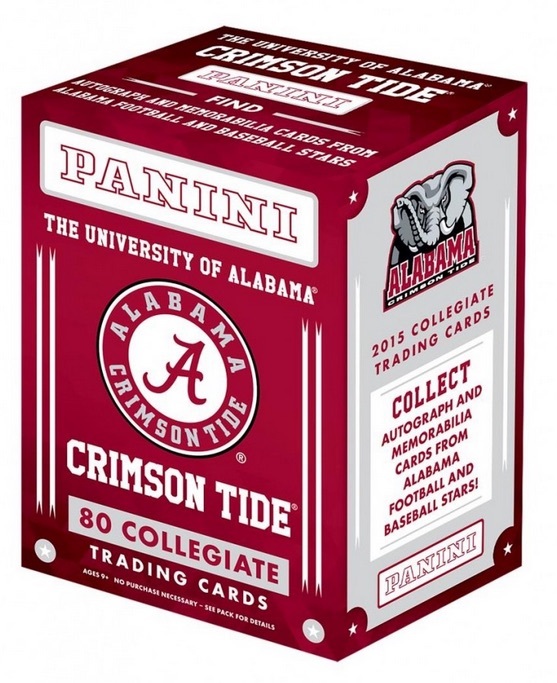 Part of a new Collegiate focus following Panini's acquisition of the NCAA license, 2015 Panini Alabama Collegiate trading cards take a multi-sport look at the University of Alabama. Each Blaster box includes one autograph or memorabilia card and Retail boxes double that amount. The 80-card base set covers the history of the Crimson Tide through their athletics. Former football, basketball and baseball players receive a detailed focus, including revered names like Amari Cooper, A.J. McCarron, Mark Ingram, Julio Jones, Joe Namath, Ozzie Newsome, Latrell Sprewell, Robert Horry, Alex Avila and Mikey White. Collectors can find Signatures with parallels limited to 99 or less. A handful of Memorabilia cards are also included in the checklist. Honors is the lone insert and it highlights former All-Americans and Heisman Trophy winners. Parallels come into play with Silver, Black and Gold options that cover all the base and insert sets. The University of Alabama was previously covered in a 2012 set from Upper Deck. 80 cards. Player position noted below. i have purchased (4) boxes. the first (2) contained the same memorabilia card. the 3rd box did have an autograph & insert. the last box had nothing. out of (4) boxes i have (2) of the same memorabilia card, (1) autograph & (1) insert. i was expecting more from this product.